Material lists are a valuable tool on larger, long-term contracts where they can be used to assist with day to day planning or even as a shopping list for buying or hiring equipment. 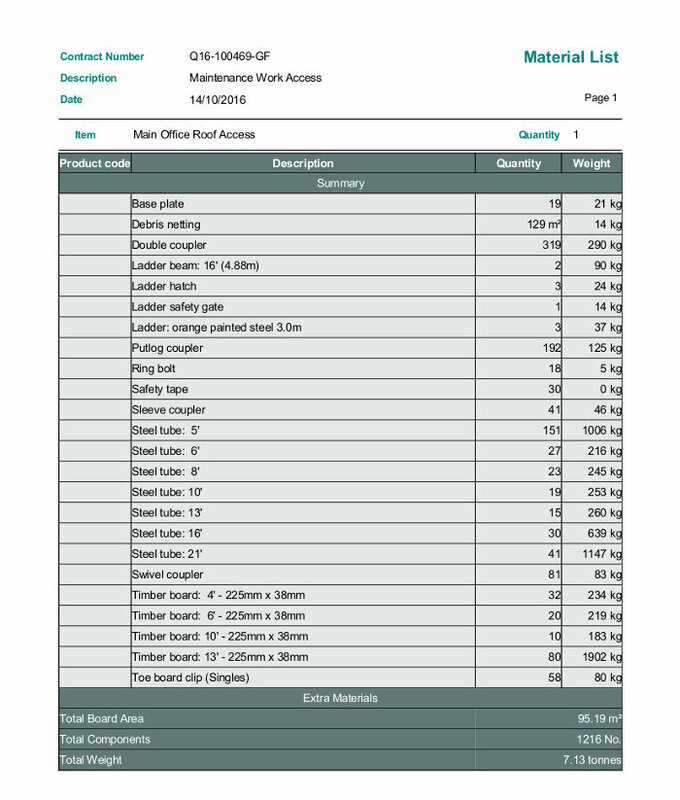 Report IT automatically produces a fully itemised material list of all the required scaffolding components (tubes, boards, fittings, ladders and any additional items). Lists include the weights of materials which can be used to plan and price transportation. Material lists can be printed for selected lifts, heights or elevations which is useful where materials are supplied progressively. Alternatively, they can be emailed as attachments. Components can be renamed and you can change the product codes and weights. You can also export the material list to Microsoft Excel to manage your stock.